Located within the Visitor Centre at Healey's Cyder Farm near Newquay, this outward looking event could not be better placed in terms of easy access. We look forward to seeing you by the press! A pdf of the speakers schedule can be downloaded here. 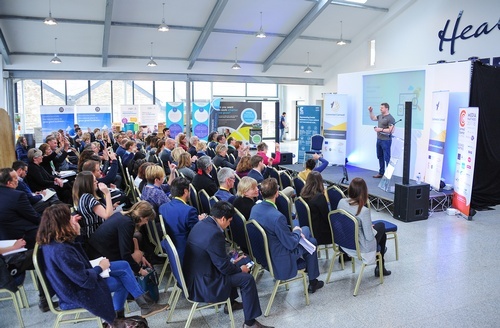 Funded by Export for Growth, the seminars at Connected Cornwall are FREE to attend, with an optional ticketed breakfast and lunch. Businesses of all sizes and descriptions throughout Cornwall are being invited to think connectivity at our FREE conference being held at Healeys Cyder Farm, near Newquay, on Wednesday 14 November. Sponsored by the fantastic Export for Growth programme, which focuses on helping Cornish businesses develop into international markets. With handpicked workshops tailored to benefit Cornwall’s businesses all under one roof, this is set to be the best FREE business event of the autumn. An impressive line-up of speakers will be sourced from Cornwall Chamber of Commerce's extensive network. these seminars allow delegates to pick and choose their chosen interests and create a schedule of events to suit their business needs. Joining them will be folks from the mighty Google Digital Garage, who will deliver hands-on workshops sessions including Social Media Strategy. The conference is the first of its kind in the county. Selling abroad – or even over the Tamar – isn’t just about goods and products, it’s about services, tourism and concepts too. If you’ve got a website, it’s just as easy to get a new customer in Berlin as Bude, so this event is all about looking beyond local and regional markets and thinking bigger. Attendance at the seminars is FREE. To make the most of the day, Cornwall Chamber of Commerce invite you to attend the ticketed breakfast or lunch events, which will sell out quickly. Get yours now and be part of the action all day.